. إن الخدمات الممتازة وحسن الضيافة العالي في أجنحة أوكس جيتواي تجعل إقامتك تجربة لا تنسى. يقدم الفندق فرصة للاستمتاع بشريحة واسعة من الخدمات بما فيها: واي فاي مجاني في جميع الغرف, مكتب استقبال 24 ساعة, مرافق مخصصة لذوي الاحتياجات الخاصة, تسجيل وصول/مغادرة سريع, تخزين الأمتعة . في أجنحة أوكس جيتواي غرف نوم يزيد عددها عن 92 صممت بذوق وعناية لتوفر لك كل وسائل الراحة . بعضها يحتوي أيضاً على خزانة, مناشف, سجاد, غرفة معيشة منفصلة, تلفزيون بشاشة مسطحة. سواء كنت من محبي الرياضة أو كنت تتطلع لتفريغ عناء نهار صعب، ستجد خدمات ذات مستوى عالي بانتظارك كمثل جاكوزي, مركز للياقة البدنية, ساونا, مسبح خارجي, سبا. إن أجنحة أوكس جيتواي هو خيارك لخدمة الفنادق الراقية في المدينة. يرجى العلم أن كافة الغرف تشتمل على 30 دقيقة من الاستخدام المجاني للإنترنت دون تكاليف إضافية. إذا كان ميعاد الوصول لا يقع ضمن هذه الساعات، يرجى الاتصال بالفندق لترتيب تسجيل وصول خارج الأوقات المذكورة. Hotel is perfectly positioned for access to CBD, restaurants, pubs, large convenience stores, coffee shops, walks, port, river etc. Hotel is clean and tidy with great staff. Very welcoming staff even under a bit of pressure with numbers at desk when I arrived. Sharp work! Also parking included! Thank you. I stay in Townsville 2-4 times each year - this will be my go to from now. Excellent accommodation with incredibly helpful and friendly staff. Old - run down. Room was small and gruby. Stains on the carpet. There was fleas or bed bugs. Could not wait to get out after one night. Say wi fi is free. Nooooo after 30 minutes free they start to charge you. Cups etc (the very liitle there was) is on the floor under the sink in the room. Oaks - you have some good rooms in other cities - but you have lost me (and my company) after this one. the towel rail on exit to the shower is 5 feet from the ground, which is eye height for my partner. She walked out of the shower, the door opens onto the wall so she walked straight into the towel rack and bruised her eye.... told staff, unsure if the towel racks were adjusted. Seems weird to have a towel rack placed so high. 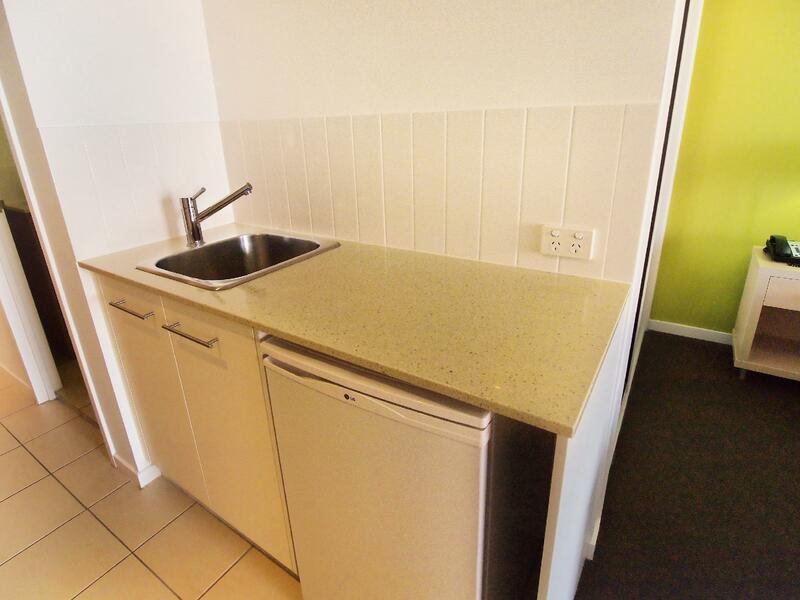 Our One bedroom apartment was excellent value for money, clean neat and tidy and conveniently located. The staff were very accommodating. Well worth a look and highly recommend here - if your staying in Townsville. I had a lovely stay - it was quiet and with the restaurants so close I was spoiled for choice. my only criticism is not your facilities but the lack of a supermarket nearby that was large enough to get a few provisions. if i had been there for longer it would have been an issue. I was out the whole day leaving my wallet and some coins in the hotel room at the TV console. I am very grateful to the chambermaid for his / her honesty. The front desk staff were very helpful and even advice us on things we can do / shop. very engaging and knowledgable of the places in the region. The overall is great except that the wifi usage is limited. We ended up staying a week. Our room was over palmer street. We couldn't sit out side for the heat of the air cons and the heat/ smell from ribs and rumps exhaust fans And we had no hot water in our shower. We were told yo let it run abit before getting in. Even after 10mins. Still no hot water. And the cloths dryer is stuffed. Other wise it was ok. This hotel is well appointed, very clean, great location with friendly and professional staff who go out of there way to provide excellent service. Our flight arrived early in Townsville and we were able to get early access to our apartment with no fuss. 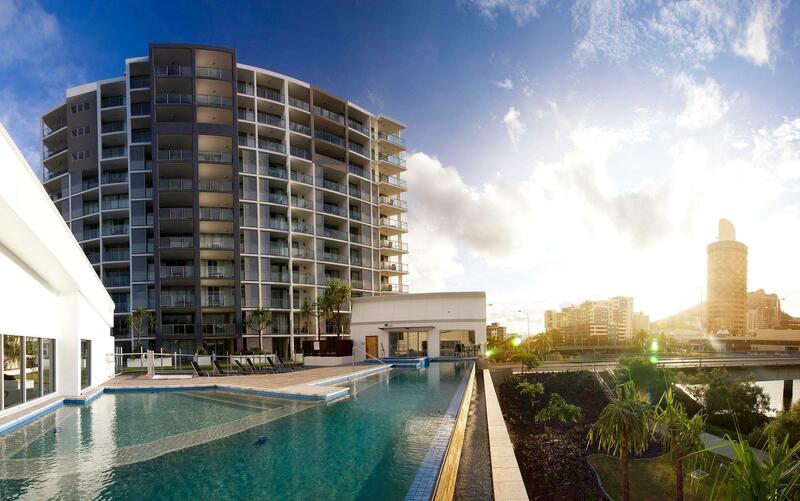 The hotel pool is a wonderful spot to cool off in and the location of the Hotel is central to Townsville CBD, major eat street and other attractions. The parking is secure and easy to gain entry too. Would recommend this Hotel for a nice relaxing staff in Townsville. We stayed here on new years eve. It was in a convenient location and suited our needs. The cot was already set up n our room, which was a bonus, the beds were comfortable. It was a nice, clean place. It was a quick stay - lots of rules when staying there, that we were afraid to laugh in our room after 10pm for fear of getting in trouble. it would be great if there was a minibar added so that for those not cooking for themselves could have a snack. Stayed at this hotel for a Convention & my friend & I were very happy with our choice. So close to a wide range of eating establishments and not far from a large supermarket. We requested twin beds which were comfortable. We were allowed to get into the room a bit earlier than expected - very nice after an early start to the day. The view from our balcony was beautiful . Unfortunately we didn't get time to check out the gymnasium & pool, but would definitely stay here again if we have to go to Townsville again. Thank you for a pleasant stay. We were initially checked into a newly refurbished room but unfortunately no sofa bed so we were offered another older style room which was nice but not as good as the first. Staff were helpful & friendly however we met friends who were booked into a room that was already occupied.Good restaurants & bars in the area.Would stay again. Balcony, views, room in general. We met up with family and staff kindly put us all on the same floor. Very enjoyable. Appreciated rules about parties as it was close to New Year and although I was a bit worried when I heard noise while walking to my room; the rooms were very sound-proof. We were a bit unsure about where to park when we first arrived and signs were not always attached to available parking bays. Excellent staff, very clean and spacious room. The room was also very quiet with no noise from adjoining rooms. 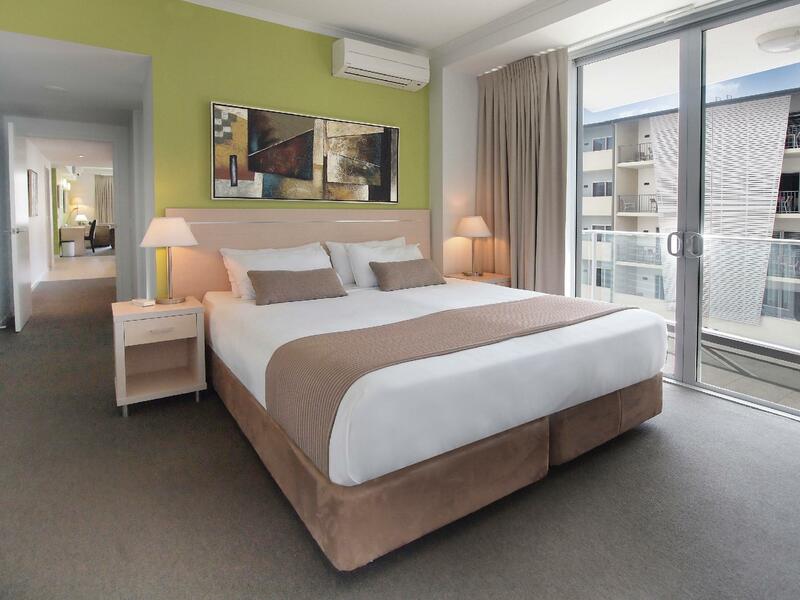 The hotel is located very close to many quality restaurants and a short walk to the centre of Townsville's business district and also speciality shopping. It is also a short distance from the harbour for ferry to Magnetic Island. The overall stay was very good. Great value for money. Lots of eating options within walking distance. Nice view even though I was on one of the lower levels. The air conditioner was a little noisy from time to time even on the quiet setting but worked really well and the ceiling fan was also a nice touch considering the high temperatures outside. We only had two nights there for a just a short getaway from airlie beach, but was a perfect hotel for us an our baby boy. The room was clean an generously big. My only concern was the amount of parking in the basement. Other then that a great location, close to a street full of great bars an restaurants. 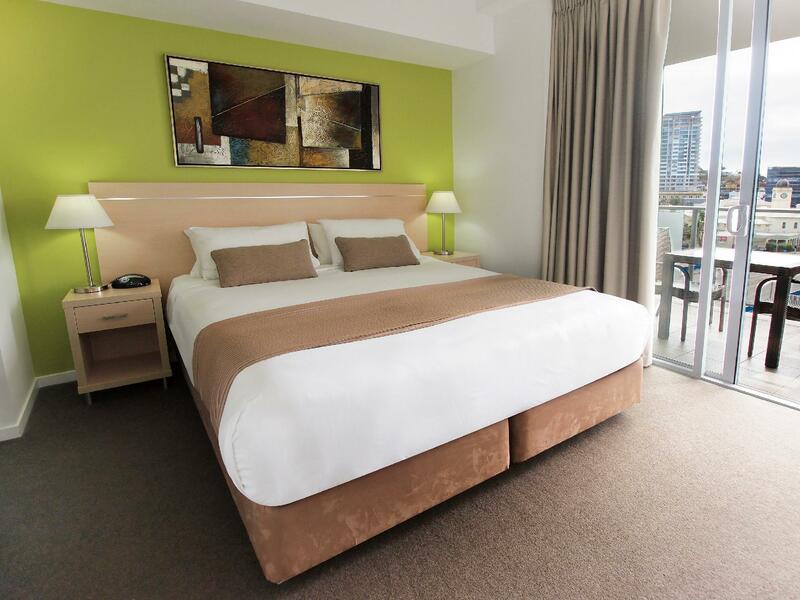 Short walk to the city centre an Short drive to the strand an shopping centres. Spent 4 nights, great location, initially was going to hire a car however the location is central and found we could get around easy via walking, public transport or taxi. Close enough to walk to the ferry terminal for Magnetic Island. Morning walks through the city and Strand, some great restaurant choices next to the hotel. Would stay here again if visiting Townsville.